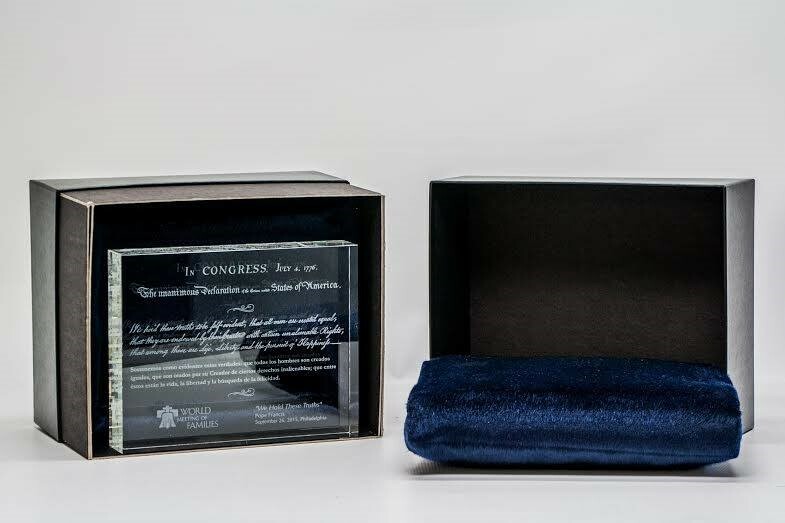 Spike’s Trophies has been honored to create awards for many celebrities and famous figures over the last several decades, and this year we were extremely proud to have been given the incredible opportunity to create a customized plaque for Pope Francis, during the monumental 2015 Meeting of Families and Papal visit in Philadelphia, PA. Serving our Philadelphia community and the nation for decades, we couldn’t be happier that we were chosen to represent both our city and our country. Taking place this year between September 25th and September 27th, the World Meeting of Families was an international Conference on the Family founded by St. John Paul II, and sponsored by both the Philadelphia Archdiocese and the Pontifical Council for the Family, in Rome and Vatican City. The event, which occurs every 3 years in different cities worldwide, brings together thousands of Catholics with the communal goal of strengthening families. 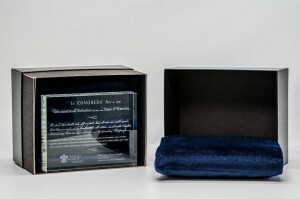 This year’s event was particularly monumental, as it marked the first visit of Pope Francis to the United States, one of only 10 apostolic journeys made to the country by Popes in its entire history. An estimated 850,000 people were present to celebrate mass on the Benjamin Franklin Parkway on Sunday, September 27th. This plaque was carefully crafted by the experts at Spike’s to reflect our city, country and the esteemed position of Pope Francis. 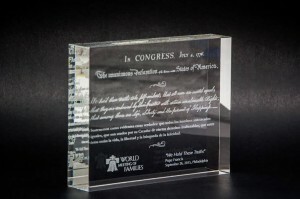 We used unique optic crystal to make this award striking and highlight the laser-etched text, which was carefully chosen to include the heading, and an excerpt, from the Declaration of Independence, as well as the World Meeting of Families logo. 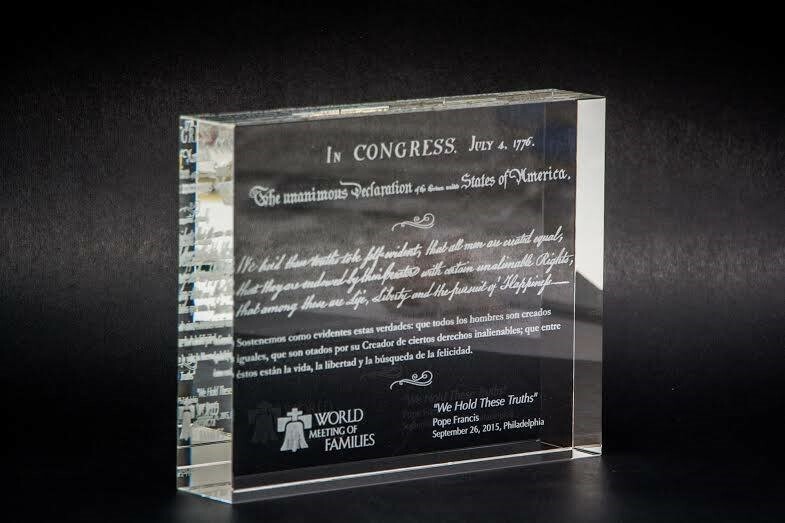 The award was presented to the Pope by delegates from both the World Meeting of Families and the City of Philadelphia during his two-day visit to the city. This entry was posted in Uncategorized on October 13, 2015 by Spike's Trophies.